Rehaan, 5, asks his father two questions every day and the first one used to surprise his father - “Can I go to school tomorrow?” Very fond of books, Rehaan has not gone to school since August, when he was diagnosed with cancer. Rehaan's father Mahboob Basha is a Mathematics school teacher in Nellore, Andhra Pradesh. His mother Sharmila also used to be a teacher and Rehaan had a little brother Arhan, only this January. The problem started innocuously – with Rehaan suffering from constipation in August. When he stopped eating his parents decided to take him to the hospital. The last thing his parents expected was this serious a diagnosis. Rehaan has Burkitts Lymphoma - cancer of the lymphatic system. It is rare outside Africa and is a fast growing-cancer that needs immediate treatment through chemotherapy. 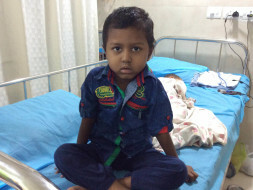 From the diagnosis till now, the family has spent Rs 5 lakhs on Rehaan's treatment. Rehaan's father has a modest salary of Rs 10,000 per month. He encashed all his savings and fixed deposits but could raise only Rs 3 lakhs. “When what I had was not enough, I asked my friends and family to help. I feel terrible that Sharmila's father, at his age, had to sell off his ancestral property. Even that raised only Rs 2 lakhs,” he says. 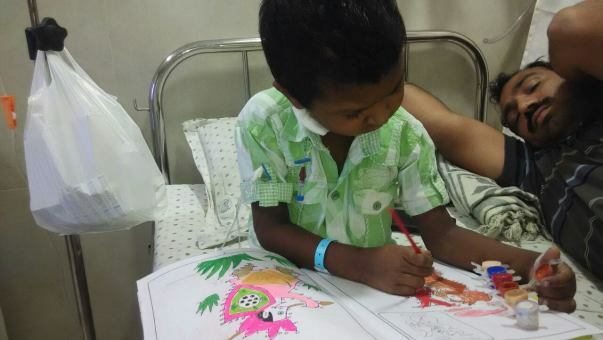 The family still needs Rs 3.5 lakhs to complete the rest of Rehaan's treatment. 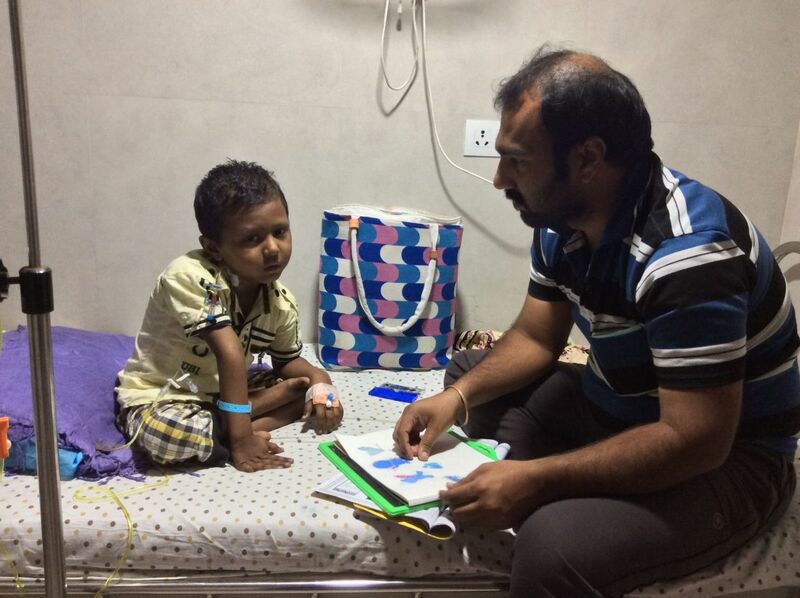 Because Arhaan is too young, only Rehaan and his father are in Chennai for treatment. 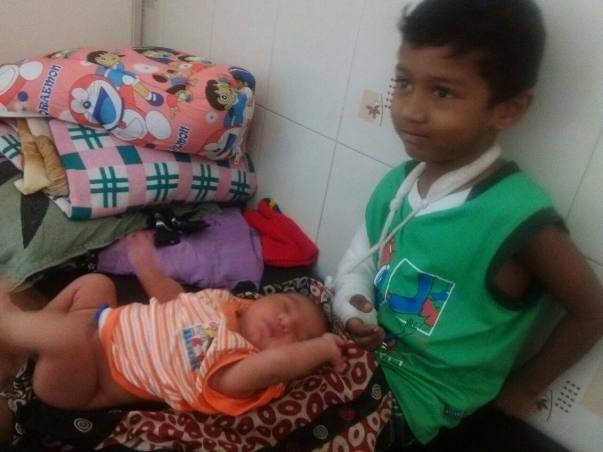 Rehaan is facing a gruelling treatment away from home with only his father. “Even though they are not here, his mother calls every two hours to talk to him. And Rehan keeps himself busy – he has started to paint very seriously,” says his father. To his father, Rehaan is the same happy, thoughtful child with a terrible illness hanging over him. Rehaan takes his treatment quietly, with a quick mind that finds opportunities to get his father to buy him small treats. The swelling in his face is the only physical difference that he can discern. And the fact that every morning Rehaan asks him his two questions religiously, like a ritual. "When will we go home?" To both the questions, his father has the same answer - "As soon as you get better." Rehaan's family is unable to raise the money needed for the last round of his treatment. He has a good chance of recovery. They need our help saving their 5-year-old son. Donate now. The specifics of his case have been verified by a medical team at the concerned hospital. For any clarification in the treatment or associated costs, contact the champion or the medical team. Now he is in hometown and he is coming for follow up with a doctor once a month.Your support is helping Rehaan getting the best treatment that he deserves. Rehaan and family are traveling from their hometown in Nellore to the hospital in Chennai for undertaking Rehaan’s treatment. Your support is helping Rehaan getting the best treatment that he deserves. I am Uthra Nagarajan, a Milaap Fellow. I met Rehaan and his father recently at the Kanchi Kamakoti Child Trust hospital where Rehaan was undergoing chemotherapy. Tired but active, Rehaan was drawing and painting as his father looked on, when I visited. Rehaan is under a three-month chemotherapy regimen, after which his doctors will decide a future treatment plan. “We will go back to Nellore after a few days,” explained Mehboob Basha, Rehaan’s father. 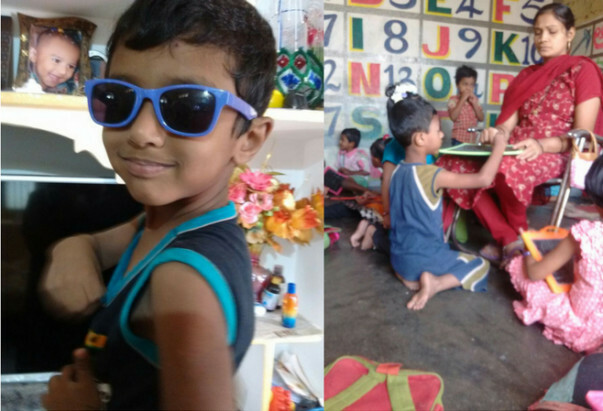 “We usually come to the hospital for a week of chemotherapy and four days of observation.” Whenever they come to Chennai for the treatment, Mehboob either stays in the hospital or at a friend’s house. Apart from chemotherapy, Rehaan also takes medication - two tablets a day, for his condition. He eats and sleeps well, and loves to paint during his time at the hospital. Rehaan’s family has spent around Rs. 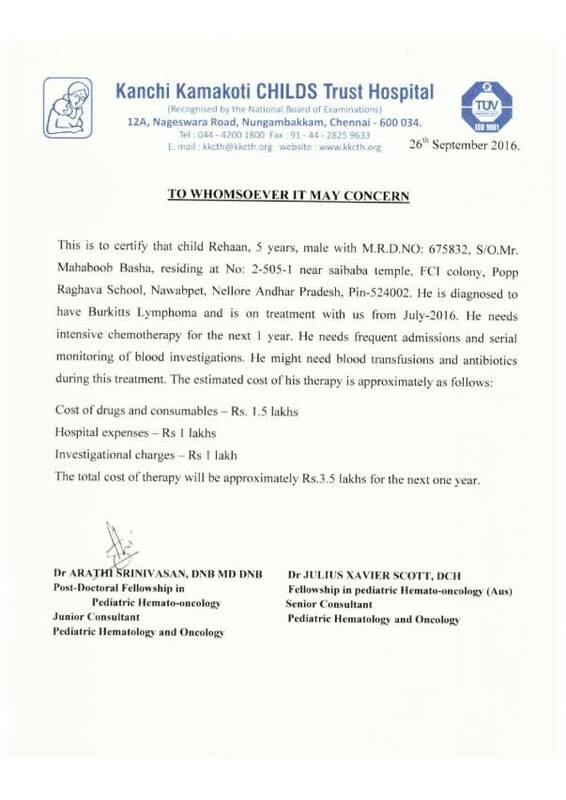 6.5 lakh until now for his treatment and are able to manage his current medical expenses. Mehboob is happy about Rehaan’s progress and is deeply grateful to all the donors.